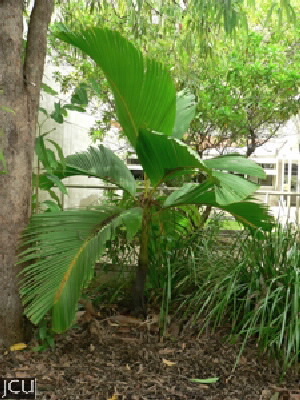 The distinguishing feature of this palm from the Seychelles, is the stilt roots supporting the slender stem. The leaves split irregularly with age and so appear pinnate. The dark brown fruit that are produced on hanging inflorescences, are 2-3 cm long.